The most common cause of a staph infection is bacteria that live harmlessly on many people—until invading an open wound or scratch. A staph infection can spread to the blood, bones, joints, and organs in the body, including the heart and brain. A “staph infection” (pronounced “staff” infection) is caused by Staphylococcus bacteria. You can recognize a staph infection by its red, swollen look. It looks like an abscessed insect bite, with a red rash. A staph infection is painful, and it’s often present in seemingly simple skin eruptions. Boils and cellulitis can be caused by a staph infection; the bacteria can invade something as minor as a pimple. According to the U.S. National Library of Medicine (Medline Plus), a staph infection can be caused by any one of 30 different bacteria, but the most common is Staphylococcus aureus. 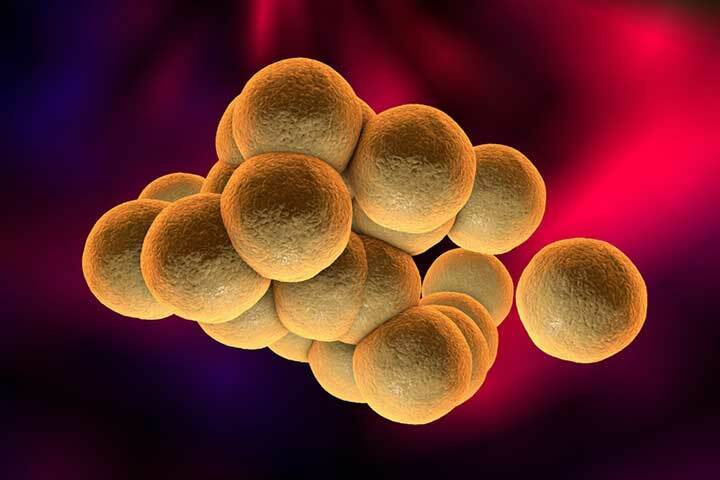 Staph bacteria can be found on the human body—most commonly on the skin and in the nose. About 30 percent of us have the bacteria, according to the Centers for Disease Control and Prevention (CDC). The bacteria are harmless, until they end up in a scratch or wound. When that happens, a staph infection develops. Staph infection is often a problem in athletic programs, partially due to the frequent skin-to-skin contact. Staph infections are contagious. In fact, if the bacteria are on a towel or clothing, it can spread to the next person who touches it. Professional football players Daniel Fells (Giants) and Lawrence Tynes (Buccaneers) each experienced a career-ending staph infection that developed into MRSA (methicillin-resistant Staphylococcus aureus), a dangerous antibiotic-resistant staph infection. Wash your hands frequently with soap and water or use an alcohol-based hand sanitizer. Do not share personal items, such as towels, clothing, cosmetics, or bandages. Shower right after exercising, but only in a clean shower. Clean sporting equipment with antiseptic solution or wipes before using it. Do not use a common whirlpool or sauna. A staph infection usually is diagnosed by visual examination by the physician and a culture of the blood or pus in the wound. The physician may also use a cotton swab to gather some nasal secretions, which are then cultured for evidence of the bacteria. The cotton-swab method commonly is used as a screening test for the bacteria, such as when you are admitted to a hospital. Staph infections often abscess and are lanced and drained. A sample of the infected material is sent to a lab for a culture, which will indicate the drugs to which the sample is sensitive or resistant. With this information, the physician then chooses an antibiotic. Antibiotics can gain control of a staph infection and reduce the risk of recurrent infections. A study conducted at the Southern Illinois University School of Medicine, published in the journal Clinical Infectious Diseases, evaluated 383 children (median age 3) with a staph infection that required incision and drainage. A month after the initial infection, bacterial-swab tests found that about 50 percent of the children (178) who had received antibiotics had no signs of staph living on their skin or in their nostrils, reducing the risk of recurring infection. However, the bacteria remained on the skin of about 75 percent of the children (26) who did not receive antibiotics. Additionally, children who remained colonized with staph a month after initial infection were about twice as likely to experience a recurrent infection than those who did not have staph on their skin. That’s 101 children (60 percent) compared with 54 children (30 percent). The study primarily evaluated the antibiotics clindamycin and trimethoprim-sulfamethoxazole (TMP-SMX). Of the two drugs, clindamycin was the most effective at eliminating staph colonization and preventing recurrent infection. Why clindamycin was superior to other antibiotics is unknown and warrants further study, Hogan said. alcohol, antibiotics, arthritis, bacteria, bone, bone infection, bones joints, brain, children, food, food poisoning, immune system, infection, infectious arthritis, long term care, mrsa, pneumonia, septic arthritis, skin, staph infection. I went for a scan and was diagonise with Clear fluid in the pouch of douglas 16mm. How bad is this because I just treated staph aureus 2months ago. Now I’m having lower back pain. Please I need help cause I’m ttc.